In the same way that the entire plant is contained in germinal form in its seed, so the totality of anthroposophy can be discovered in Rudolf Steiner's central work The Philosophy of Freedom, a book that lays the foundation for the modern scientific path to the spiritual world. Given the centrality of the Guardian of the Threshold to modern initiation, one may therefore ask where this theme is to be found in The Philosophy of Freedom. Prokofieff presents his insights to this little researched question in the first part of this volume. 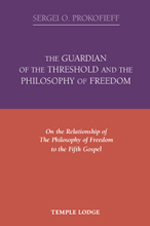 In the second part, he investigates The Philosophy of Freedom's connection to the content of Rudolf Steiner's research relating to the Fifth Gospel. Through Prokofieff's thoughtful commentary, new light is shed on the connection between Rudolf Steiner's early and late work. Study of the relevant texts reveals that the roots of Steiner's early work lie in the same spiritual reality - the Christ Impulse - as those of the later anthroposophy he was to develop. SERGEI O. PROKOFIEFF, born in Moscow in 1954, studied painting and art history at the Moscow School of Art. He encountered anthroposophy in his youth, and soon made the decision to devote his life to it. He has been active as an author and lecturer since 1982, and in 1991 he co-founded the Anthroposophical Society in Russia. In Easter 2001 he became a member of the Executive Council of the General Anthroposophical Society in Dornach. He is the author of many books, 24 of which have now been published in an English translation.